CBeebies Land expansion planned for 2017 – TowersStreet - Your premier Alton Towers guide! Plans submitted to Staffordshire Moorlands District Council have shown an expansion of CBeebies Land is coming to Alton Towers Resort in 2017. A new “rotating ride” with “themed carriages that will rise and fall throughout the ride” and a new building offering children entertainment are to be located between Tree Fu Tom Training Camp and Big Fun Show Time. The new ride appears to be similar to the Dumbo spinning rides found at many Disney theme parks. A plaza and buggy park will also form part of the development. An ice machine from the former ice arena as well as some small shed structures will be removed to make way for the new attractions. A number of trees will also be felled, however new planting will replace these. There is currently no information on the theme of the new ride or what will be contained within the entertainment building, but it’s likely an additional IP from the Children’s TV channel will be used. 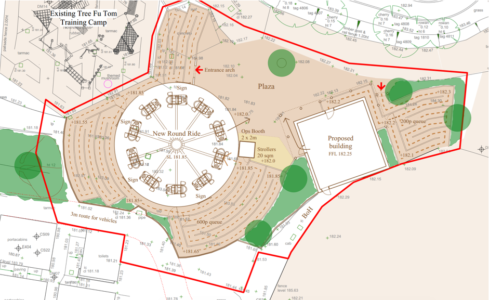 The queue line for the rotating ride appears much longer than other queue lines found for attractions in CBeebies Land, and will hold 600 people, whilst the entertainment building will hold around 200 guests. If approved construction will begin in October and completed in March, ready for an opening in the same month. 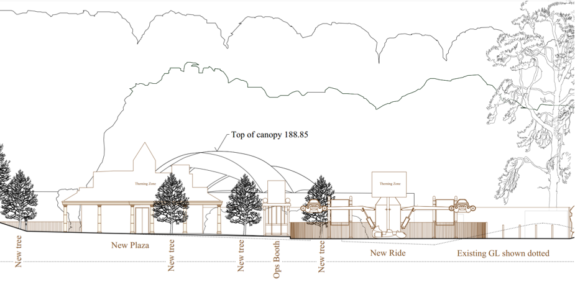 What do you make of a CBeebies Land expansion in 2017? You can discuss this and much more over on our Talk forums. And remember to follow us on Facebook and Twitter for all the latest Alton Towers news!